Directly before the wrist – imagine an extension from the thumb to the forearm – exist a tunnel. Two or sometmes three tendons run through this canal to the thumb. Usually two tendons run through this canal. In rare cases, three or even four tendons are contained in the canal. With the Quervain disease, this canal is narrowed. The tendons need to move through the canal by movements of the thumb. With a narrowing of the canal, the tendons are grinding on the canal’s walls. Hereby a (severe) pain occurs. What is the causes of de Quervain`s tenosynovitis are known? The exact cause of de Quervain`s tenosynovitis is not known. But also diseases of the tendon sheath with inflammatory or rheumatic primary disease can lead to a tendonitis (de Quervain disease). The de Quervain disease can also occur within a occupational disease. How does a physician recognize a de Quervain disease? For hand surgeons, a de Quervain disease is easy to recognize. The significant swelling in the area of the canal (1. extensor tendon section) is often visible externally. 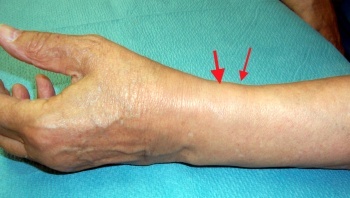 The illustration shows such a swelling at the 1. extensorvtendon section. If additional symptoms occure at this location due to pressure and a specific test (Finkelstein test) results positive, the de Quervain disease can be diagnoses easily. The illustration shows the execution of the Finkelstein test: The thumb is striked into the hand. Then the wrist is moved into the direction of the small finger . additional diseases occure nearby, like an arthrosis of the thumb basal joint. In such cases it might be necessary to perform an ultra sound scan or an x-ray examination. The illustration shows an advanced arthrosis of the thumb saddle joint (Rhisarthrosis). The pain can be similar to a tendonitis de Quervain with this disease. Both diseases can occur simultaneously! Wherefrom does the term Quervain come for this disease? De Quervain was a swiss surgeon who described this disease the first time in 1896. In his honor, the disease was named like this. Copyright © 2019 hand and elbow. All Rights Reserved.